Smart Calculator . . . Formula Calculator . 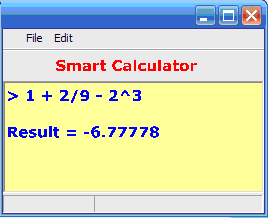 . .
Smart Calculator . . .
. . . The "Formula" Calculator . . .
A "Smart" Calculator (Formula Calculator) automatically takes into account PEMDAS order. The person using the calculator does not need to be concerned about which numbers to evaluate 1st, 2nd, 3rd, etc.